For many American listeners, constant Canadian prog rockers Saga have always stood on the fringe of recognition. They have always received greater acknowledgment and praise within their own country and overseas. Yet, I have a vague, but good, recollection of their 1978 debut from my college days. 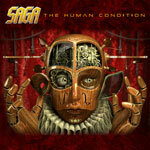 Now working in their 30th year, Saga return with a new album, The Human Condition, and a new singer, Rob Moratti. Mr. Moratti replaces founding member Michael Sadler who retired in 2007s to 'focus on his family life and retire from the stress of being in an active traveling band.' Fear not stalwart fans, Moratti may sound different than Sadler, but he delivers the goods. Other pieces demonstrate this more progressive character as well. On 'Hands Of Time,' Saga uses a softer feel, nearing Floyd-like impressions, to create an atmospheric arrangement revealing Moratti's excellent gift. Later, 'A Number With A Name' and the humorous 'You Look Good To Me,' bring quirky, funky beats and rhythms that defy the other typical conventions found on this disc for novel and vibrant sound. Finally, Ian Crichton's novel mixture of chords and tricky fret work on 'Now Is Now' make for the top track on the album. With a new singer in Rob Moratti, prog veterans Saga remain constant and creative. If The Human Condition signals a new era for them, then it is a good one. This work is a true delight for prog rock fans everywhere. Highly recommended! With a new singer in Rob Moratti, prog veterans Saga remain constant and creative. If The Human Condition signals a new era for them, then it is a good one. This work is a true delight for prog rock fans everywhere.